I didn't make it to the Seafood Festival. I was not in great shape this morning when I woke up. We had a long day and night of eating too much and telling lies. There were stories that lasted us all weekend ... like Ernest Borgnine's secret to a long life. It was verified on the internet ... look it up. A hint: it's not what you think but at 93 ... he was quite impressive. I stretched out on the couch to watch college football while the rest of the gang fought the crowds (estimated at 30,000 by the Chamber of Commerce). Not long afterward, the gang returned with lengthy critiques and pictures to prove their case. 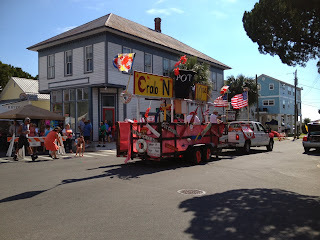 There was a parade ... three floats and a dozen beads. The featured "float" was an airboat emblazoned with "Lord ... save our souls" or something like that ... maybe it was "Lord ... show us your ...."
There were vendors lining the streets. 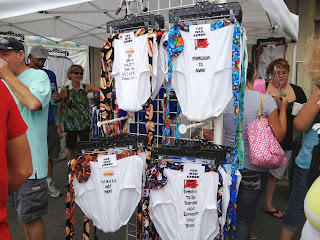 This shot was from a booth selling men's aprons with sayings like: "It's Not a Party until the Wiener Comes Out" or "Danger Hot Meat". The seafood festival was really just two trucks with two long lines of patrons. Our group gave up ... They ate at home. There were far less than 30,000 people attending although there were probably a thousand waiting to get served in the two lines. The sad truth is ... Cedar Key (once the largest port in the state) has gone through tough times. Hurricane damage and devastation of the seafood industry has blighted the city. 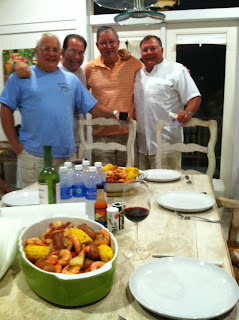 It's our last night here and we celebrated the twins' birthdays by fixing a big seafood/ low country boil. The guys cooked sausage, corn, crawfish, shrimp, onions and potatoes.